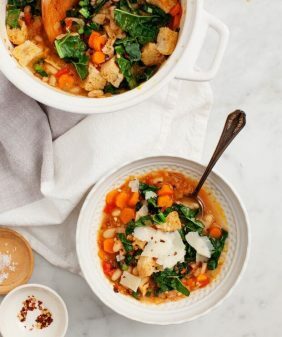 Filled with kale, mushrooms & white beans, this healthy vegetarian stew is perfect for warming up in winter. Wine and balsamic vinegar add depth of flavor. It’s Food Matters Project Monday, and this one might be a stretch. This week’s pick was coq au vin, and while I’m surely on board with the vin part, chicken isn’t my thing, and I wasn’t all that inspired to try a vegetarian version of it. Jack and I were out at dinner on Friday night, and he just so happened to order coq au vin (what are the odds?). Never having tried the dish before I became vegetarian, I was surprised to see that it looked just like a rustic mushroom stew. 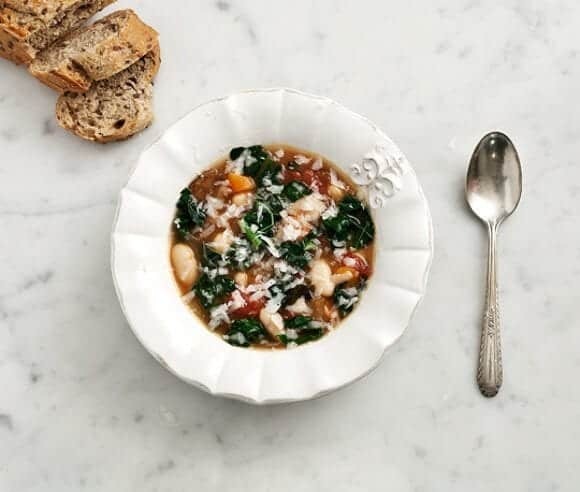 So I took some Tuscan inspiration and decided to make a mushroom, white bean, tomato, and kale stew the next night. It turned out to be the perfect thing for a cool night and a low-key Saturday dinner at home on our patio. Cooking the mushrooms with wine (and also a little balsamic), gave it a nice zing that balanced the hearty mushrooms and cannellini beans. Serve it with a nice bottle of red wine and some crusty bread. In a large pot heat the oil over medium heat. Add the onions and a few pinches of salt and sauté until translucent. Add the garlic, carrot, mushrooms, and rosemary and cook, stirring occasionally, until the mushrooms have cooked down (3-5 or more minutes). Deglaze the pan with the white wine and stir to get any bits that might be stuck to the bottom of the pan. Cook for 1 minute or so. 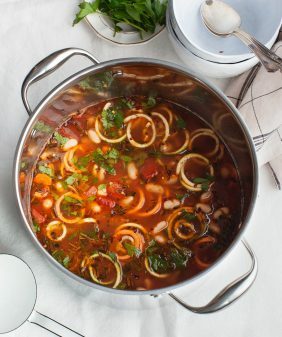 Add the splash of balsamic vinegar, tomatoes, beans, and broth. Reduce heat and simmer for 10 minutes or so. Add the kale and simmer for 5 more minutes, until wilted. Taste and adjust seasonings. At this point, I added a generous amount of salt and few grinds of pepper. Top with the chopped fresh basil and shavings of pecorino cheese, if using. Yum! I always love a good bean recipe! This is a very beautiful and creative twist. This looks great and similar to what I planning for next week’s cassoulet! Looks gorgeous! If you can get a delicious meal out of it, I say that’s inspiration enough. I was totally stumped by this week’s recipe and didn’t even attempt a vegetarian take on it. I am inspired by this stew, however! Looks amazing. 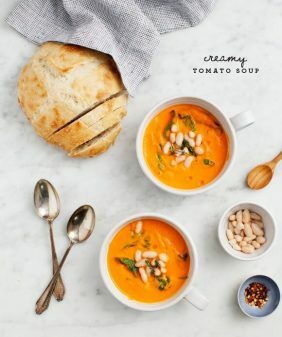 This soup looks delicious and comforting. I love your photos! i love that you made a vegetarian version of the dish! i never even heard of coq au vin before. i’m sure this version is better than the original. Sounds like a perfect healthy meat-less stew! 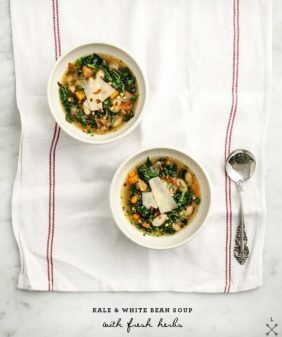 White beans and kale–one of my favorite combinations. This sounds very rustic and northern Italian, especially with the pecorino garnish! This recipe was so exactly what I needed. I get a CSA box every week and though I LOVE greens I am running out of ways to use them (I will be glad when the spring/summer produce starts) I used mixed greens in this and then threw in some turnips and golden beets just to use them up. It was so totally yummy! I love to prove to people that healthy can taste good! Delicious! Made this for dinner last night and it was great. However, I didn’t have wine on hand so I opted to go a little heavier on the balsamic to deglaze. This still gave the mushrooms a nice kick! Next time I am going to make this with butter beans. Thanks for the great inspiration this will become a regular in my quick dinner repertoire. Made this tonight. It was so fast to cook and absolutely delicious! 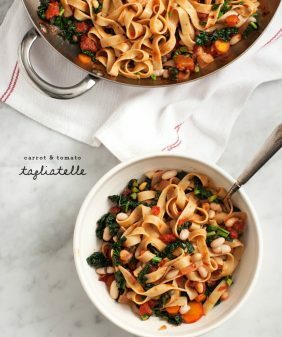 So excited to try this recipe for dinner tonight, although while making it, I struggled with the directions because you never said when to add the kale!! 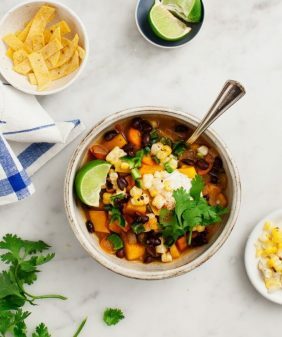 I did it with the broth and beans, but it might be a helpful edit for others! I cannot wait for it to finish cooking. Smell amazing! It’s there in the 3rd step. I like to add it near the end so the kale retains some of it’s vibrant green color. Hope you liked! This is the most flavoursome soup I’ve ever had, just delicious!! Highly recommend! I cooked this tonight and it came out beautiful and delicious! My hubby even packed some for lunch tomorrow. Other than sautéing using water instead of oil, and skipping the added salt and optional pecorino, I followed the recipe pretty closely. Thank you! I made this recipe last night and it was the perfect winter warming soup to help get me over my cold. I left out the wine, rosemary and basil because I didn’t have them on hand and it was still delicious. I also ate it leftover for this afternoon’s lunch and it was even better the next day.